Not long after we cross the orbit of Pluto, we begin to escape the effects of the Sun. Here we enter interstellar space. From this point on, we will likely not encounter another object until we reach the next nearest star system. The distances between the stars is so incredibly vast, that it would take us 4 years traveling at the speed of light just to reach the closest star to the Sun. 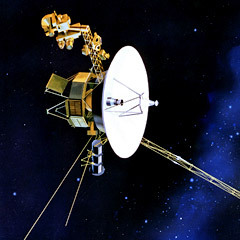 The Pioneer 10, Pioneer 11, Voyager 1, and Voyager 2 spacecraft are about to be the first man-made objects to leave the Solar System. These spacecraft have cleared the known boundaries of the Solar System and are searching for the heliopause, which marks the end of the Solar wind and the beginning of interstellar space. Both Spacecraft are expected to continue to operate for the next 25 to 30 years, sending back data on magnetic fields and interstellar particles. 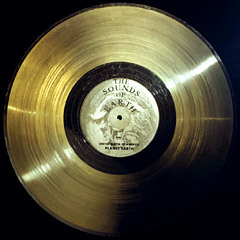 In the event that there is other intelligent life out there somewhere, NASA included with both Voyager spacecraft an audio disk entitled "Sounds of Earth" This 12-inch copper disk features greetings from the people of Earth in 60 languages, music from several different cultures, and natural sounds such as ocean surf, thunder, chirping birds, whale song, and others. It could be called "Earth's Greatest Hits". The disk also contains electronic information that an advanced civilization could convert to pictures, diagrams, and printed messages, including a message from President Carter. 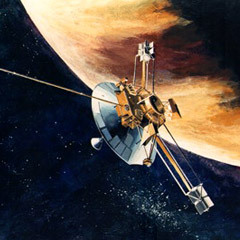 Both the Pioneer and the Voyager spacecraft also carried a plaque showing the location of our solar system in relation to 14 pulsars and the center of the Milky Way galaxy. These spacecraft may indeed be our ambassadors to the unknown beyond. As we pass the outer limits of the Solar System, we are faced with a vast emptiness. Beyond our home system lies the great mysteries of deep space. Here, the distances are so great as to boggle the mind. The nearest star is four light years away. That means that it would take four years to get there if you could travel at the speed of light, which is 186,000 miles per second. We can only look out into that emptiness with our telescopes and be humbled at the wonder of it all. This concludes our Tour of the Solar System.